The ThinkPad X1 wireless touch mouse is the perfect companion accessory to expand the X1 experience. 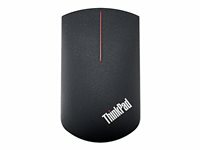 This thin and light dual mode travel mouse can be conveniently stowed in a pocket or bag while you are on the go. Optimized for travel, it offers portable productivity whether presenting at a meeting or catching your next flight. Flip the mouse over to use the integrated touchpad presenter and navigate through slides with full control. It is a thin, light and tough accessory.